Encinitas logged another data point last week in our ongoing effort to come up with the best solution for pedestrians crossing the railroad tracks in Cardiff. 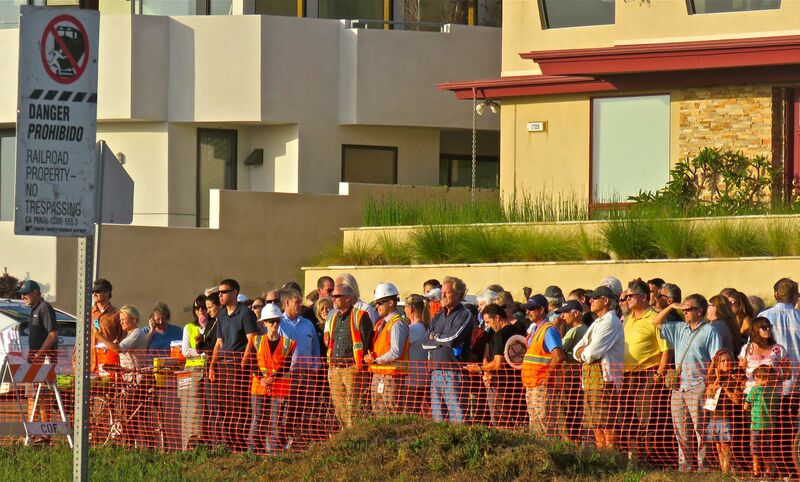 More than 100 people crowded the edge of the rail corridor to hear the planned demonstration of a “wayside horn” near Montgomery Ave., which would be required as part of a legal at-grade, pedestrian-only railroad crossing. This test was part of the City Council’s effort to explore all options related to improving the rail corridor. The loudest horn — required at car crossings. Its volume is designed to be heard by someone driving inside a car with the windows up and the radio on. The same horn volume, but the speakers directed down at the tracks instead of out to the nearby residences. The reduced decibel horn that was recently installed in San Clemente at a pedestrian-only crossing. Apparently this reduced volume horn is the first of its kind, and it received regulatory approval because pedestrians don’t need as loud of a warning about a coming train, given that they aren’t enclosed in a car. The third horn was the least loud of the three. It sounded more like a train whistle, and it seemed barely audible above the sound of the bells on the crossing gate, which are also required. 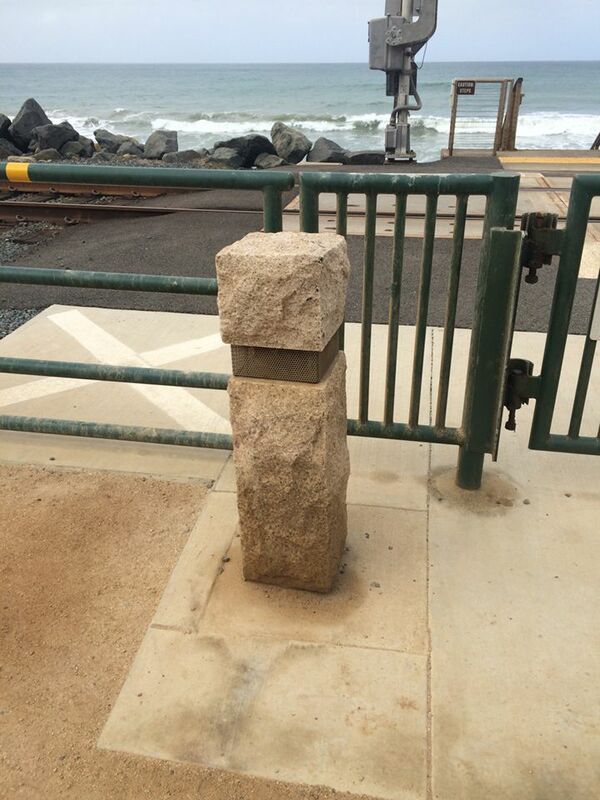 In San Clemente, the wayside horn is inside this rectangular post; the sound is localized around the crossing. 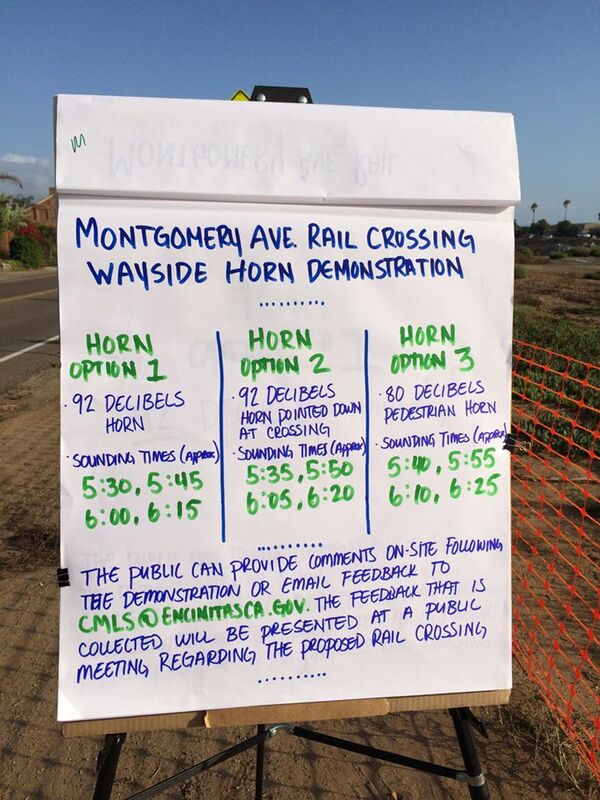 Earlier last Thursday, I rode a bus north with some members of the Coastal Mobility and Livability Working Group to hear San Clemente’s wayside horn in action. One notable thing about hearing an actual, installed wayside horn is that the train itself makes so much noise rumbling along the tracks that it nearly drowns out both the wayside horn and the bells. In our Cardiff demonstration, the wayside horn didn’t happen simultaneously with a passing train. But a horn is still a horn. From my perspective, the ideal situation would be to have an entire corridor quiet zone, eliminating all required train horns. Downtown San Diego has achieved this type of quiet zone. Another very expensive but tempting option is constructing a pedestrian underpass like the one at Santa Fe Drive somewhere in the vicinity of Verdi or Liszt, where the topography is less flat. An underpass wouldn’t add any additional noise to the corridor. An underpass is substantially more expensive to build, which would by definition affect other priority infrastructure projects in the city. We’re supporting our citizens’ working group and asking our rail corridor visioning study to give the City Council the costs and regulatory requirements of these alternatives so that we can weigh all options. This wayside horn demonstration gave us valuable data to assist in our ultimate decision-making. The sound was logged at various measuring stations to provide objective data. With the coming re-construction of the Chesterfield intersection associated with double tracking, the question of putting in a wayside horn at Chesterfield will also be front and center. We have directed that supplemental safety gates be installed, which would allow for the possibility of a wayside horn. One of the most challenging aspects of this planning process is that decisions are so interconnected. No issue – horns, crossings, fence, trail – can be looked at in isolation. And importantly the city doesn’t control the corridor, although we have input. Other regulatory bodies affect the decisions we can make. It can sometimes feel like the goalposts are moving during a game. So now you’re up to date on the latest. It’s tricky, but the potential rewards of better connectivity, more crossings and less noise are exciting to envision. With input from residents and experts, we remain committed to working out the best solution possible for the community!